There is nothing quite like a kitteh tongue shot to make my day! We agree! Here's to a tasty weekend ahead, Katie! Yep. It tastes good to be sprung from the slammer! HaHaMeow! Cute kitty! Do you taste like chickums? Nah you just giving your self a bit of tlc after being in the slammer! We kitties taste awesome! I hope that does not inspire humans to start licking us - ewww! Does it taste a little like chicken? We always said you were tasty Katie. It's a good thing you are cleaning up a little sweetie cuz you never know when you'll have another photo shoot gig. You gotta be ready when they call. the question is, "Does it taste like chicken?" 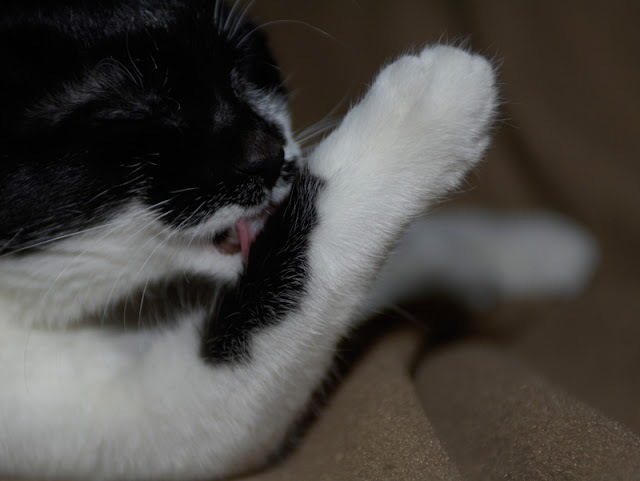 I love watching my kitties bathe themselves - I find it so relaxing. Love this pic! does you arm taste like chick-hen, Katie? HAH! Do you think maybe taste is why Humans DON'T bathe this way?